Mesa Verde National Park offers visitors a look at the cliff dwellings left by the Anasazi or Ancient Pueblo People who made the area their home for 700 years, from 600 to 1300, before leaving for reasons still not fully understood. The park is in Colorado’s southwestern corner, 56 miles west of Durango and 30 miles east of Cortez. Mesa Verde was created in 1906 to protect the best-preserved of the cliff dwellings from these early Native Americans. More than 4,000 known archeological sites, including 600 cliff dwellings, have been identified within the park’s 81.4 square miles. The cliff dwellings were built by Ancient Pueblans starting in the late 1190s, after they had lived on the tops of the mesas for 600 years. The buildings of sandstone held together with adobe mortar were erected in alcoves beneath overhanging cliffs and ranged from one-room storage units to villages of 150 rooms. The residents continued to farm on the mesa tops while living in the cliff dwellings for more than a century. By the late 1270s, the tribe began migrating into New Mexico and Arizona. They were gone by 1300. Today, visitors can tour cliff dwellings and see panoramic views from atop the mesas. The first cliff dwelling is 21 miles from the park entrance on a steep, narrow, winding road. Visitors in the summer months are required to select a one-hour tour of either Cliff Palace or Balcony House each day and to buy tickets in advance at the Far View Visitor Center for those tours and the tour of Long House. 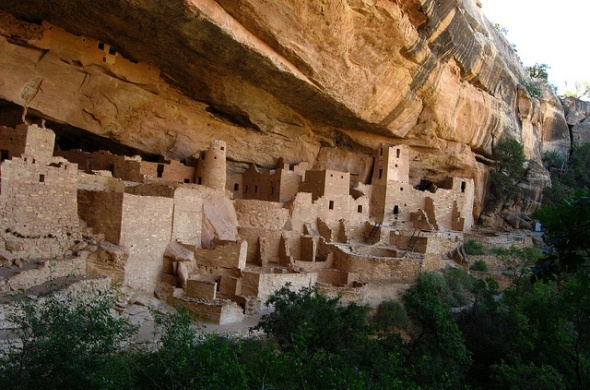 • Cliff Palace is the park’s largest cliff dwelling with 150 rooms and 23 kivas. A one-hour, ranger-guided tour takes visitors up five ladders of 8 to 10 feet in length and has a 100-foot vertical rise. The walking distance is about 1/4 mile round-trip, and the southern exposure for this ruin makes it hot during the summer. • Balcony House has 40 rooms and the most challenging tour in the park. Visitors must climb a 32-foot ladder and crawl through a 12-foot-long tunnel lined with a boulder to enter the ruin and scale a 60-foot open rock face on two 10-foot ladders and steps carved into the rock to exit. The ranger-guided tours last an hour. • Spruce Tree House is the park’s the best-preserved cliff dwelling and the only where visitors can enter a kiva, which was used for religious ceremonies. This ruin has 130 rooms and eight kivas, making it the park’s third-largest. It is open in the summer for self-guided tours and is the only cliff dwelling that does not require a tour ticket. In the winter, there are three free, ranger-guided tours each day. It is a short walk from the Chapin museum on a steep, paved trail. • Long House has 150 rooms and 18 kivas and the park’s most in-depth tour, which is ranger-guided and lasts 90 minutes. The tour, offered only in the summer, requires visitors to climb two 15-foot ladders and hike 3/4 mile round-trip, with a 130-foot gain in elevation. Vehicles over 25 feet in length are prohibited on the winding, 12-mile road on Wetherill Mesa leading to Long House. • Far View Visitor Center is open through the summer and offers exhibits about the park and its history and exhibits of contemporary Native American arts and crafts. It also sells tickets for tours of Cliff Palace, Balcony House and Long House. • Far View Archeological Sites are six surface sites along a short trail. These sites offer a close-up view of pueblo architecture, including the remains of towers and kivas built between 900 and 1300. Nearly 50 villages that were home to hundreds of residents have been identified in this area. • Chapin Mesa Archeological Museum features dioramas illustrating Ancestral Puebloan life, exhibits of prehistoric artifacts, and a 25-minute orientation film. It also has restrooms. The Spruce Tree House cliff dwelling is a short hike away. Rangers recommend that someone with a half-day or less spend the time visiting the Far View Visitor Center, the Chapin museum and Spruce Tree House. The recommended one-day visit takes in the visitor center, either Cliff Palace or Balcony House, the Chapin museum and Spruce Tree House, the Mesa Top Loop Road, and the Far View Sites.